Via Nova Children’s School is a preschool for children ages 2 to 6 years old. Our school has been serving the community by providing outstanding child care since 1994. Our play-based, Spanish-English program operates from 8 am to 6 pm, Monday through Friday. 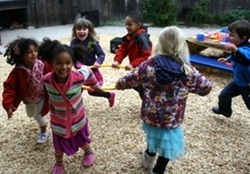 Via Nova Children’s School is a community of teachers, parents and children working and learning together through play. We provide a safe, warm and nurturing environment in which the uniqueness of each child is honored. ​At Via Nova, children come together as a community where they learn to develop relationships based on trust and respect, while exploring new ideas and the world around them. The teachers, informed by the children’s emerging interests, facilitate hands on and cooperative learning that fosters the children’s social, emotional, cognitive and physical growth.